In April 2018, one of China’s most visible military diplomats, Senior Colonel Zhou Bo, gave a speech at Kings College London. He was asked about the vexed issue of “freedom of navigation” in the South China Sea. A year before the colonel’s talk, three Chinese naval warships had transited through the English Channel en route to exercises with Russia in the Baltic Sea. They had passed through British territorial waters without interference. How then would China respond toward Royal Navy warships passing through Chinese-claimed territorial waters in the South China Sea? Colonel Zhou’s answer was succinct but disturbing: China obeys British rules in British waters, so the United Kingdom should obey Chinese rules in Chinese waters. If this is truly a reflection of Chinese attitudes to international law, then the implications are alarming. It would mean that China doesn’t really believe in the concept of universal principles governing the law of the sea everywhere on the planet. The Chinese military will make use of freedom of navigation in other parts of the world but deny that it applies in its own claimed waters, where it says Chinese rather than international rules are in effect . Both the UK and China have signed and ratified the United Nations Convention on the Law of the Sea (UNCLOS) and the document is clear. It is entirely legal for naval ships from any country to sail through even the most hotly disputed regions of the South China Sea. If actions such as these go unchallenged, the world will be reverting to an era when navies had to fight their way through blockades and when seaborne trade, the lifeblood of the global economy, was subject to the whims of coastal states. If the UK and France adopted the same legal position as China, they could have blocked the Chinese navy from passing through the English Channel. In Asia, Indonesia, Malaysia, and Singapore could use the same argument to block the Strait of Malacca to Chinese vessels. Is this the world that China wants to create—where states can unilaterally close waterways? The consequences for international peace would be dire. This is a key reason why the disputes in the South China Sea should concern the wider world. While they may appear to be a fight over nothing—tiny, economically useless islands—they are also a fight about everything: whose rules will run the 21st-century world? Each of the major claimants argues that it is the sole rightful owner of entire groups of rocks and reefs in the South China Sea. China and Vietnam both claim the Paracels and Spratlys in their entirety; the Philippines claims a subset of the Spratlys, which it calls the Kalaayan Island Group. Malaysia occupies five reefs close to Borneo. Brunei claims one reef in the same area. None is willing to give ground to the others, and the result has been a long period of diplomatic stalemate punctuated by periodic crises. 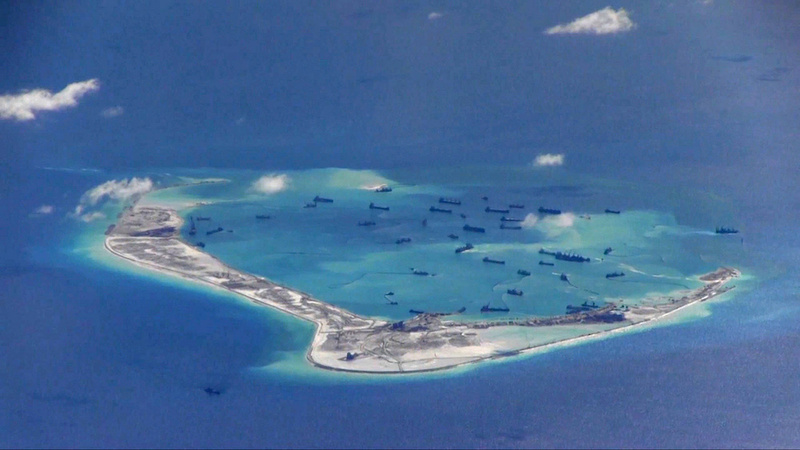 China began the construction of artificial islands in the Spratlys, in the southern part of the South China Sea, in September 2013. They are now almost ready. Beijing has insisted that these are civilian installations, but satellite imagery has clearly revealed the presence of military facilities, including hangars for surface-to-air missiles, barracks, and weapons systems. US military sources say China has also deployed anti-ship cruise missiles and surface-to-air missile systems to the new bases. Three of the new islands feature three kilometer-long runways, easily usable by military aircraft. At the time of writing, only civilian aircraft and unarmed transport planes have actually used these runways, but it is likely that China has the ambition to deploy fast attack jets to the bases at some point. If past behavior is anything to go by, then it will wait for a pretext—some perceived “provocation” by the US, for example—before it does so. More importantly for China’s Southeast Asian neighbors and other states with an interest in peace and security in the region, the artificial islands give China the capacity to maintain a large-scale presence of naval and coastguard ships in disputed areas. China has the ability to monitor other countries’ activities and intervene at short notice. This presence has given China also the ability to prevent the other coastal states from developing resources in the South China Sea. One tactic is explicit threats of military force: in 2017 and 2018, we saw China intimidate Vietnam into blocking the Spanish energy company Repsol from developing gas fields in the Exclusive Economic Zone (EEZ) claimed by Vietnam but desired by China. Events took a similar course in the Philippines, which faces a looming and critical energy shortage because of the depletion of its existing offshore gas field, Malampaya. It currently generates over a fifth of the Philippines national electricity output. One potential solution is for the country to develop the large gas resources under the Reed Bank, not far from Malampaya. An International Arbitration Tribunal ruled in 2016 that these resources are within the Philippines’ EEZ. However, President Rudigro Duterte of the Philippines said in May 2017 that his Chinese counterpart, Xi Jinping, had told him there would be “war” if Manila tried to exploit that gas. In short, China’s actions in the South China Sea present a threat to the rule of law globally and to the security of Southeast Asian states. The overlap of territorial disputes between the rival claimants and the maritime disputes that involve powers from outside the region creates the potential for a local incident to turn into a serious conflict. For many observers, the territorial disputes over the islets have appeared too complex to be resolved. That impression has been reinforced by the claimants’ deployment of pieces of purported historical evidence dating back centuries. My own conclusions from examinations of this evidence is that most of it can be discarded since it consists of vague mentions of undefined locations. Under contemporary understandings of international law, what is required to prove ownership of an uninhabited feature (i.e. piece of land) is evidence of practical administration (in legal language, à titre de souverain). Moreover, as the 2008 judgment by the International Court of Justice concerning features disputed between Malaysia and Singapore demonstrates, a legitimate claim to one specific feature does not necessarily apply to other features in its vicinity. There is, on paper, a simple solution to the disputes in the South China Sea: all the competing claimants agree to maintain their current positions on the various rocks and reefs, recognize the other claimants’ current occupations, and commit to occupying no further features. They would then divide up the resources of the sea according to the rules laid down in UNCLOS and cooperate to manage them sustainably. The governments of the rival claimant states would still need to persuade their own populations that this is a reasonable course of action. They would, in effect, need to tackle the “emotional” claims to the rocks and reefs that have built up over recent decades. The best way to do this is through the presentation of evidence. This is unlikely to be a simple process. However, both China and Vietnam are “propaganda states”: their one-party systems have been very successful at persuading their populations to accept changes in ideology over the years. This would be just another iteration of national belief. At present, there are three likely outcomes to the disputes in the South China Sea: First, the current situation continues with periodic rises in tension and the risk of military escalation. Second, the Southeast Asian claimants submit to Chinese pressure and abandon their territorial and maritime claims. Third, some kind of recognition of the status quo as an equitable solution. The first option carries the constant risk of war. China would prefer the second option, but the cost to its reputation and relations with the other states would be simmering resentment. In fact, I would argue that China’s territorial claims in the South China Sea are a major obstacle to its overall strategic interests in Asia, which require the peaceful development of cooperative relations with its neighbors. A key reason why those neighbors seek to engage the US and other powers in regional security is because of their concerns about China’s territorial agenda. If China were to resolve the disputes, it would reduce its neighbors’ desires to seek alternative security relationships. The third option is difficult but has the best chance of generating a lasting peace. This difficult road is worth taking because it preserves the principle of the peaceful settlement of disputes and the primacy of international law. It is based upon a belief, well understood in Europe, that states must settle rival claims on the basis of right rather than might. How, then, could Europe contribute? It would require two separate interventions: one aimed at resolving the underlying territorial disputes and the other at the defense of UNCLOS. There are many experts within European universities and think-tanks with the expertise to collate, translate, and assess the evidence put forward for the various territorial claims. Recent academic research suggests that, in most cases, it would be clear there has only ever been one effective occupant of each feature. An “academic taskforce” could be assembled to evaluate the evidence and disseminate it to the claimant governments as well as the experts and academics in those countries, together with associated media campaigns in the relevant languages to inform the wider publics. It would provide an empirical basis for compromise. The defense and promotion of UNCLOS requires a different approach. The EU and its member states need to maintain clear support for the convention in all their public statements on maritime affairs and communicate this frequently to the South China Sea claimants. The next step would be an investigation of which claims in the sea are compliant with UNCLOS and which are not. This would be followed by public statements and diplomatic representations to defend the UNCLOS regime. In particular, suggestions that China enjoys “historic rights” that supersede UNCLOS must be challenged and refuted. Those EU states with the capacity to do so should be encouraged to demonstrate their continuing interest in the peaceful international order by deploying naval vessels into the South China Sea to demonstrate that Europe regards a threat to the international order in one part of the world to be a threat to it everywhere. European states have other levers, too. They could refuse Chinese naval ships permission to make port visits and reduce other forms of military cooperation. They could help Southeast Asian states to build up the capacity to monitor and control their legitimate EEZ claims and increase military cooperation with them. They could sanction Chinese companies that are engaged in predatory behavior within other countries’ legitimate EEZs. They could add stipulations about respecting legitimate EEZ claims to all maritime agreements with the claimant states and insist that fish catches, for example, are traceable to domestic EEZs. These, and other relevant and targeted, countermeasures could be adopted to deter rule-breaking in the South China Sea. This is clearly an idealistic strategy. It would demand funding and time and carries diplomatic risk. The alternative, however, is worse. This year’s Munich Security Conference will take place on February 15-17. Berlin Policy Journal and its sister publication Internationale Politik are again the MSC’s media partners.